Departement of Vaucluse - Pop. : 1.200 h.
11 km north-west of Carpentras via the D7. 20 km east of Orange via the D975 then the D8. 21 km south of Vaison la Romaine via the D977 and the D88. Located in Upper Vaucluse, in the middle of the Orange, Vaison la Romaine and Carpentras triangle. This circular village grouped around the church is situated on a mount. 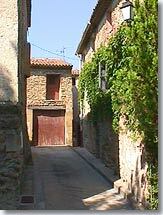 Its narrow streets which you can only discover on foot lead you to the defensive walls of the château and the church. 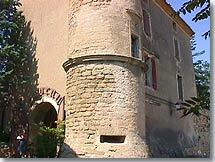 You will see its elegant Provencal bell tower standing atop a 12th century watch tower. As you wander around Vacqueyras, you'll come across fountains, old age-worn doors, windows overflowing with flowers, and beautiful old houses looking onto the little streets. You'll no doubt notice the sundial and its half-Latin half-Provencal inscription. 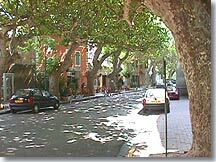 At the foot of the village you'll find Cours Stassart, lined with plane trees. It was laid out in the 19th century, to replace the defensive ditches beneath the ramparts. As you leave the village, heading for Sarrians, you might like to stop at the Espace Botanique de Coste de Coa a botanical centre in an area of 10,000 m² presenting a number of botanical trails and a signposted tour to learn about Mediterranean vegetation, trees and aromatic plants. 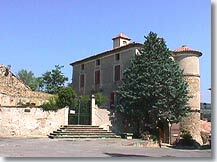 Vacqueyras is still essentially an agricultural community, and produces one of the three major vintages of Cotes du Rhone de Vaucluse. The vineyard extends as far as the Dentelles de Montmirail. The Vacqueyras vineyard has been renowned for many years, but it was only in 1990 that the local wine-growers obtained official recognition of the quality of their wines, which have now become a Côtes du Rhône appellation d'origine controlee (AOC). If you wish you can taste it free of charge at the La Vigneronne wine co-operative, on the secondary road taking you to Gigondas. Vacqueyras is not just well-known for its wine. 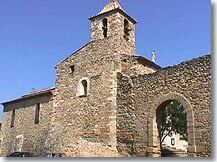 One of the most famous troubadours, Rimbaut de Vacqueyras, was born here in the 11th century. He was the son of a knight, but became a juggler and plied his trade at the court of the Prince of Orange. He must have been quite a performer to still have people talking about him 9 centuries later ! Guided tour of the village. Chapel of Notre Dame de Pitié (17th century). Tennis, fishing, pétanque, walking and horse-riding. Climbing. 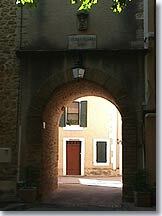 Gigondas (3 km), Beaume in Venise (5km), Violès (5 km).